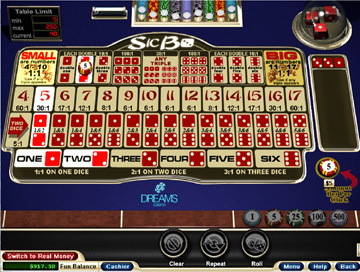 Sic Bo is a three-dice casino game that plays more or less like Craps or Chuck-a-Luck, but with a couple of adjustments. The game originates from Southeast Asia and is developed from an ancient Chinese dice game. It is also known as Tai Sai or Dai Siu (what means the same as Great Little), or under the name of Cu Sic (‘Guess the stones’). Live it is played with three dice which are shaken in a cup and then shown on the table. Learning to play this game takes an average reader a few minutes to understand the rules and layout. But then you will get the hang of it with its associated payoffs. It is a casino game that offers a lot of variety. Online it will not differ too much from the real casino floor and just as with a real casino table, bets can be set by placing the chips on the designated right side of the table. There are many different ‘squares’ or ‘boxes with Sic Bo. 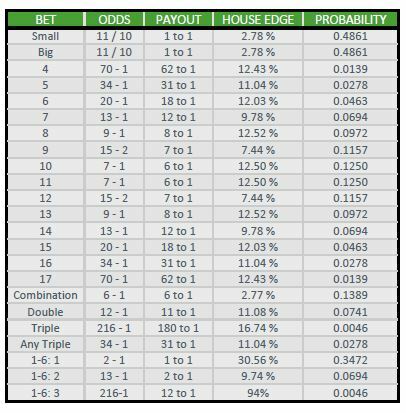 As said, the intention is that you predict what is being thrown on the table with the three dice and you are required to place a wager on one of the many bet options indicated on the table layout. The dice are then put in a plastic cylinder and given a fair shake. When the results of the dice are revealed, several spots on the table will be termed winners. If you bet on any of these spots, you will be paid according to the odds on the paytable. Claim your welcome bonus with Unibet Casino! 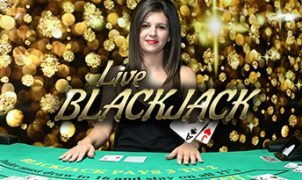 By playing Live Sic Bo Online allows you to experience the game from your home, but with real live dealers who perform all the live activities. As with a real casino, there is always a limited number of tables or ‘playgrounds’ available in one single online casino. Although ofcourse when you are not able to play in a certain Live Casino, you can always switch to another Live Casino. Due to the fact that playing in a Live Casino is still online, it might happen that you play alone or with several players at a table. 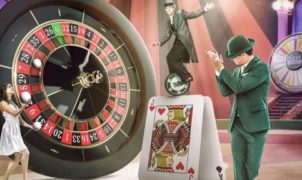 And as online casinos want to offer a 3D and interactive experience, cameras facilitate several angles and during the rolling of the dice, which are hidden under the cup, the camera will be focused on the dealer, table numbers or the cup in many live casinos. Once the dice have been ‘rolled’, the camera changes to the dice and the combined amount the numbers represent. This is not a super quick game, such as Live Roulette or Blackjack, each round normally takes up about 45 seconds to 1 minute placing your bets, ‘rolling the dice’, receiving your winnings (or taking your loss) and bet again. At a first glance it might be a bit difficult to see the odds and the keep a good overview of what is a strong bet and how to win the most. But after a short introduction about the combinations and the odds, you will get the hang and thrill of it quicker than you think. Small – Wins on total of 4-10, except for a three of a kind. Probability of winning is 48.61%. Pays 1 to 1. House edge is 2.78%. Big – Wins on total of 11-17, except for a three of a kind. Probability of winning is 48.61%. Pays 1 to 1. House edge is 2.78%. Put on small – The value of the three dice thrown, has to be 4 till 10 to pay out. If a triple falls (3 x 1’s, 2’s or 3’s) you will not win anything. You will be paid 1: 1. Turn into big – The value of the three dice thrown must be between 11 and 17 in number of eyes. If a triple falls (3 x 1’s, 2’s or 3’s) you will not win anything. This paid 1: 1. Bet on each double – Each double pays more like an easy-to-predict bet such as small and big. You can choose any of the doubles 1, 2 or 3 or the doubles 4, 5 or 6. If one of the doubles is thrown you will get 10: 1. Put on triple of any possible triples – The triples are not thrown very often and thus are difficult to obtain. If you are on a trip with any triple bet, you will bet on all triples from 1 to 6. This will pay 30: 1. You can also bet on each triple what a specific number should be. If this number is thrown out as a triple, you get paid out 180: 1. *bear in mind that this is rare and therefore has a high pay out. Put on two dice – Predict what the number of eyes will be with two dice of the three. This pays 5: 1. Enter number – You can bet on a specific number and win. The harder the number to throw is the more you will be paid out. Imagine a total of 4 thrown you get 60: 1 but for a total of 13 to be thrown you will get 8: 1. So there is a big difference right now. Indicate how often a number is thrown. On the left and right there are also six boxes with numbers from 1 to 6. If you bet on the 5, you will be paid once once they are thrown one of the three dice. If that number is thrown twice, you get paid twice, and if they are all three a 5, you get paid the bet three times. There are two ways to which you can play Sic Bo from home. ‘Online’ and ‘Live’. So what is the actual difference? With Online everything is automated and where there is no dealer or real table. The game is played rather quick and both the placing bets, rolling the dice and the outcome is much quicker than with Live play. But the main difference of course is that it is fully automated and there is not possibility to interaction with a person. It does not change the gameplay though. TIP: Register now at Unibet Casino and get a £40 Welcome Bonus! Each bet has a different payout based on probability, and you can place as many bets as you like – similar to Roulette. Each round will start by announcing to the players that they may place their bets. Then the dealer either covers and activates the dice tumbler causing the dice to be tumbled within the dice tumbler. At the same the the dealer will announce to the players that no more bets may be placed. If there is an or has an open dice tumbler, closing the bet possibility will happen before the dice ar tumbled. The dealer will then uncover the dice tumbler if needed and announces the result by calling the uppermost face of each die. When one or more die is not lying flat, the dealer will announce that the spin is a no spin. Although this will not happen often, it is good to know that this can happen and what will happen next. The dealer will cover and reactivate the dice tumbler. When the game is played in accordance with the dice being numbered 1, 2, 3, 4, 5 and 6, the dice will be called in order, from the smallest number to the highest and then the total of the three dice. At the same time as announcing the winning result the winning numbers will be entered into the system, so that you will see these in a display and if needed you can look back the last x number of throws, causing the winning areas on the layout to be illuminated. This way there will be a more continious game play and changing of the odds. As with any game, there are several strategies a (new) player can use or apply. With Sic Bo we have set out 3 strategies to suit all styles of gamblers: even money bets for steady gamblers maybe learning the game for the first time, decent returns for more adventurous punters or big combination bets for the experienced and high-roller players. We start with the Low-risk bets, as with for instance betting on red/black or even/uneven with Roulette. This strategy gives a steady learning about the game and look into the progression. Steady gamblers should use the bets with the smallest edge. The best edge in Sic Bo (2.78%) is to be found with the Small, Big and Combination bets. After some research, with your betting amouns, we would advice to make use of we recommend using the 1, 2, 4, 8 -system or the 1-3-2-4 system, though the 1-3-2-6 and the Paroli are also betting systems that are worth looking up and possibly keep at hand when playing Online Casino or Live Casino for the first time. As one might expect, this game is being offered via various Asian styled dealers. The look and feel comes back in their outfit and sometimes in their appearance. Being welcomed and hosted by a Live Host when opening a Live Sic Bo game is different to when playing just online. From now on, you can make friends while playing and use chat and webcam communication capabilities. Dealers however are often being brief. Simply tell when to bet, when the betting closes and what the outcome is. Nonetheless this gives you the opportunity to enjoy a better atmosphere and also have the possibility to meet new people with the same interest. Where can you play Sic Bo? Badfair, Ledbrokes, William Hill, Bet365 and Winner. All are offered inside the ‘traditional’ RNG (Random Number Generator) online casinos. If you’re looking for a more authentic Sic Bo experience, you will likely like the Live streaming cameras that bring you the action straight from inside a genuine Asian casino setting, where you can see the dice being rolled, and even chat with the dealer! I still don't understand this game.